POLICY FOR PLAY SAID WHAT?…Play: Children’s Default Setting | Red Said What? Play is not to be trivialized and is largely misunderstood. For young, capable and developing minds, play is serious business. 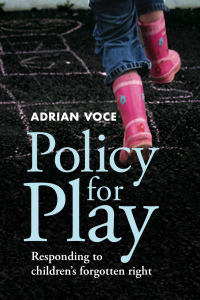 Adrian Voce author of the book, Policy for Play reminds readers in this extract that play for children is instinctual and imperative and being given the freedom and appropriate space to do so is their right. Posted on May 15, 2016 by Red said what? • This entry was posted in Childhood, On education... and tagged adrian voce, child development, childhood, Early childhood, Education, Niki Buchen Natural Learning, play. Bookmark the permalink. Play is so important. It’s an absolute travesty how schools are taking play time away when it’s such a critical component of development.